Duh duh duh-duh! Here comes Mr. Molar! Wait a second, what do you mean you haven't heard of Mr. Molar? How can you not have heard of Mr. Molar? He's like the toughest, shiniest, most upright hero we know. What? No, don't be silly, he's not a super hero. He's just a tooth for pity's sake. You can't seriously expect him to fly, shoot fireballs out of his hands, or climb up walls. But he's a tooth, right? So you can expect him to demolish any and all food in his way. He'll take a punch and keep on going. Sure, he may crack under pressure, but there are ways to patch him back up. Not to mention his delightful shape and shiny white finish! What does he do? Well he goes around and helps people finish their food. Why are you looking at us like that? We told you he wasn't super. But when you're faced with five inches of medium-rare steak? You'll be glad you have Mr. Molar on your side. So if you're a fan of Mr. Molar, or a fan of any of those other average teeth out there, you can show your support by getting in this Mr. Molar Costume. 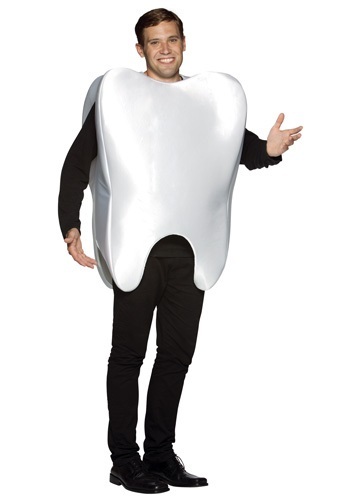 It's 100 percent polyester foam costume, shaped like a giant tooth. It's as simple as that. You can be Mr. Molar to the rescue in no time. Now, go pulverize that food!